Jennifer Aniston was born on February 11, 1969 at 22:22 PST (10:22 PM)) in Sherman Oaks (Los Angeles), CA (34 N 09 / 118 W 26) (source: AstroDatabank, Rodden Rating A). Not to overwhelm you with information, we will only assess the horoscope of Jennifer Aniston by looking at the factors that only have some meaning for her love life. The final dispositor in the horoscope is the planet that all other points and planets have to submit too. In other words, the final dispositor is the boss who has the last word. When Mars is the final dispositor, there are many impulses and compulsive desires and a lot of focus, the more so because Mars is posited in the fixed 2nd house in the fixed water sign Scorpio. The focus is on accumulating material goods for the own well-being, for the own ego (especially when relationships do not work out as wished for). Also, she can be seduced by wealth and luxury! Any planet at 0° in any sign, shows a new beginning. 0° Aquarius can be a shocking and distressing degree, though, bringing (sudden) separation, divorce and sudden change of opinion and re-thinking (this is especially applicable if Mercury, the communicator or messenger, is right on this degree). There is nervous tension and sudden leave-taking. The Moon, the Sun and Mars all in an exact aspect denote the compulsive desire to be busy, a powerful drive to accomplish things and -- in the horoscope of a woman -- a deep rooted child's wish. Pluto exact semi-sextile the Ascendant signifies a rather compulsive, forceful and even manipulative character. Jennifer Aniston seems to want everything HER way. She can manage quite a heavy workload. Transformative Pluto aspecting the Ascendant almost always denotes physical changes (changing the way one dresses, changing the haircut,...). When all planets above the horizon are retrograde, there is a profound search for personal meaning through identification with the social sphere. Chances are, however, that Jennifer Aniston may find little fulfillment in social life. (Personal) planets and points conjunct important Fixed Stars are of the utmost importance. The Ascendant conjunct the Fixed Star Arcturus of good fortune and high honors is very favorable to have in a horoscope. It brings renown and great profit, even when some turbulence comes with it too. Arcturus especially works out in a material way, bringing fortune. 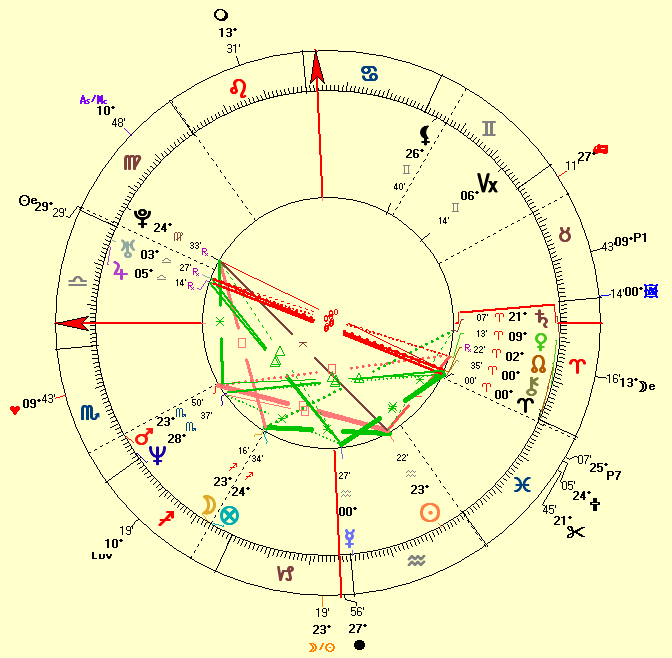 Venus (ruler of the Ascendant) conjunct the Fixed Star Algenib brings a quick temper and "questionable morals." Venus, planet of relationships and ruler of the 1st house, representing instinctive drives, here denotes somebody who extremely easily makes contacts. Jennifer Aniston got married to Brad Pitt on July 29, 2000, about 7:02 PM PDT at a Malibu estate, California. The couple separated January 7, 2005 after 4 1/2 years of marriage. Filed for divorce on March 25, 2005, citing irreconcilable differences. Their divorce was finalized on October 2, 2005. Blaming her unhappy childhood for the problems in her own marriage to Brad Pitt, Jennifer Aniston also admitted that her negative attitude played a role in the breakdown of their marriage. We delineated her marriage horoscope when we discussed and delineated Brad Pitt's love life, so we are not going to repeat it all again here. Instead you can below find her Marriage Graph for 2000. 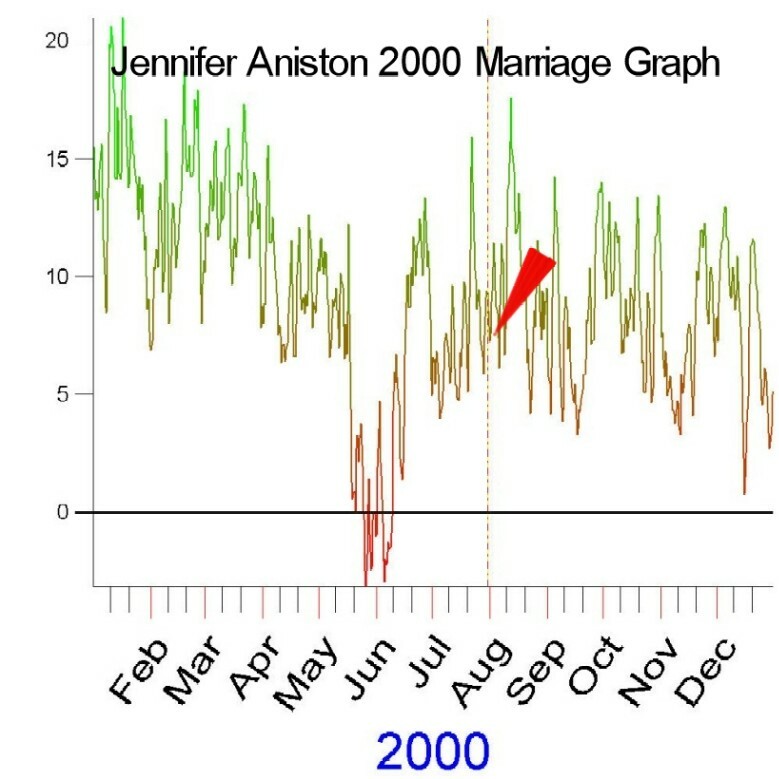 The red arrow points to the date of marriage and that date is a very mediocre one. Consider all the other "best dates" (the most elevated green ones) that were so much more favorable. As of June/July 2006 rumors go Jennifer Aniston will marry Vince Vaughn, born on March 28, 1970 at 20:12 CST (08:12 PM) in Minneapolis, Minnesota (source: AstroDatabank, Rodden Rating AA). They met in the summer of 2005 while filming a romantic comedy "The Break-Up" and officially confirmed October 2005 they were a couple. The "problem" with the annual analyses generated by Astrodamus is that this program makes use of the primary directions which are stunningly accurate ON CONDITION that the time of birth is EXACT. Astrodamus 1.0™ came up with the rectified time of 22:24:04 or 10:24:04 PM. Well now, isn't that stunning?! Her love affair with Vince clearly shows up here. Around May 2006, Jennifer Aniston and Vince Vaughn have reportedly snapped up a luxurious $12 million pad in the Chicago suburb where Vince grew up. They will settle down there and leave Hollywood to hopefully live a more private life. How will Jennifer Aniston fare according to Astrodamus? Update February 15, 2018: Reportedly, Jennifer Aniston and Justin Theroux confirmed to have separated after two years of marriage -- and seven years together overall. Jennifer Aniston’s hatred of New York doomed her marriage to Justin Theroux, friends say. Jennifer is more comfortable in Los Angeles with her close-knit group of friends. As they spent more and more time apart, their problems became bigger. He’s very focused on himself and his craft. And Jen is not the easygoing girl she wants the public to think she is. She isn’t as happy, and she is far more complicated, friends say. Update August 6, 2015: Reportedly, Jennifer Aniston and Justin Theroux were married Wednesday August 5, 2015 in the evening in a top-secret ceremony at their Bel Air mansion, Los Angeles. The couple disguised the event as an elaborate house party complete with a cake featuring puppet versions of themselves. A pastor carrying a Bible was also seen walking into the home. The ultra private pair went all out to keep the big event under wraps hiding anything related to the wedding set up in a big shed on the property. Update August 15, 2012: Jennifer Aniston and Justin Theroux announced their engagement Aug. 12, 2012. Theroux popped the question on his 41st birthday.